I've pretty much completely got off track with my October TBR, and decided to start some new audiobooks through my library's website. They have a pretty awesome selection, including quite a few Kasie West books, much to my delight. I've listened to a few of her books before, but found a few I hadn't yet started, and I was thrilled to give The Fill-In Boyfriend a listen! We meet the main character in the story, Gia, right as her boyfriend of two months is breaking up with her, minutes before going into her prom. But, being the fast thinker that Gia is, she finds a random guy in the parking lot to take his place, and a lie, and the story, is formed. Gia is one of those characters that totally grew on me as the story went along, and I could appreciate watching her character grow as I turned the pages. 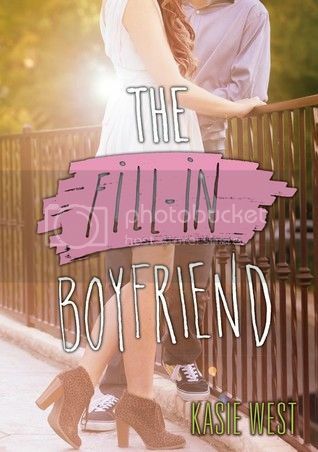 Overall; The Fill-In Boyfriend is another great book by Kasie West! I enjoyed it so much, and I'm looking forward to more by her soon! (Like, really soon. Like, my next book. Ha!) If you're a fan of contemporary novels, and you haven't already done so, check out a book by Kasie asap! !